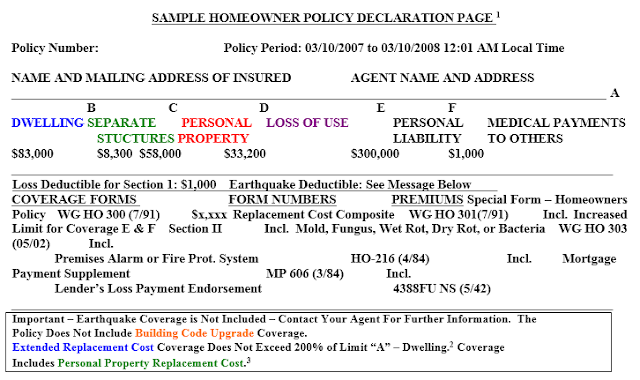 Insurance Declaration Page is a document that forms part of your insurance policy, is is also sometimes referred to as the"DEC page" of your insurance documents. Your insurance declaration page is used as a summary of the coverage and conditions of your insurance contract. Insurance policies have multiple pages. Looking through all the pages to understand the basics of your insurance policy would be complicated. The insurance declaration page simplifies this process by giving the insurance policy holder a basic overview of their insurance policy in one area so everything is clearly outlined as well as the costs associated with the coverages listed on the page. Dwelling: Your actual coverage in category “A” may be higher than stated here because your policy may contain increases via “endorsements.” We will call endorsements “extras” for simplicity. These extras often have code or form numbers. The extras should be explained in the policy wording. Most policies contain a small automatic adjustment to account for inflation. Do your own math to calculate your coverage and apply all extras your policy includes. Separate/Other Structures: Usually only covers structures that are detached from the main dwelling (garages, retaining walls, decks, fences, etc.) This limit may increase with the extras described under “Dwelling” above. Contents/Personal Property: This limit often does not get adjusted but may be adequate. You may have to list and value everything you lost but ask if your insurer will waive that rule. Your insurer will depreciate (often excessively) and pay “Actual Cash Value” until you replace. Submit receipts to get paid in full. Get extensions of time when needed. Loss of Use: Covers your comparable housing until you can move back in, and other expenses related to losing the use of your home. Basis can be actual rent or the amount your home would have rented for. Won’t cover mortgage payments but will cover extra/temporary expenses (rent, longer commute/gas, laundry, furniture rental, eating out). Building Code Upgrade Coverage: If your policy doesn’t include this, you’re probably the victim of someone’s negligence. You can’t rebuild without complying with building codes and this coverage has become standard. The amount is usually set in the policy as a percentage of your “A” coverage. Extended Replacement Cost Coverage: An extra that increases your “A” and possibly B and D limits by 25100%. Read your policy to determine which categories of coverage this extra may apply to. Argue for the max if you need it. Personal Property Replacement Cost: Means your contents are covered at replacement value so depreciated only temporarily until you replace what you lost.